As the rupee slipped, trading room chats veered around to the curious case of a weakening currency in the run up to polls. Past data shows that in eight of the nine general elections since 1984, the rupee had skidded by 3-19% against the dollar. It’s no different this year: since January, the unit has declined 12.5% — closing at 72.975 yesterday. 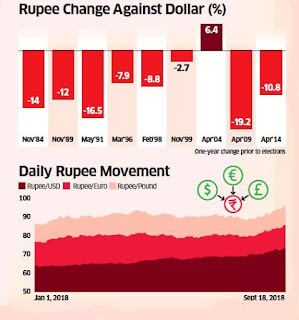 The conspiracy theory is that money flowing back into the country translates into more rupees as the exchange rate dips – generating extra funds ahead of elections. Between 1984 and 2014, the fall was in double digits on five occasions; the sharpest drop of 19.2% was in 2009. 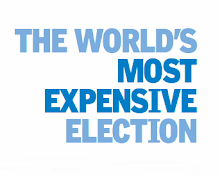 The exception to the trend was in 2004 when it had appreciated by 6.4% in a year to the election. Economists, however, scoff at the theory as capital flows aren’t simply adequate to fund the current account deficit caused by higher oil price and import of handsets and other electronic items.